I still remember when we got out first dining table as a child. We simply didn’t have room for one until my dad did some renovations on our house. The upgrades gave us room for a table the whole family could sit at. No more small breakfast nook in the kitchen. Our first meal was pork chops and baked potatoes. That dinner table changed our family dynamics. Colby and I have carried that dinner table concept over into our own family. We sit and have dinner together as often as possible. We listen to each other and engage in meaningful conversations. I absolutely adore that time with my family. Even when we think there is nothing new to bring to the table, no pun intended, one of the kids always seem to spark conversation somehow. 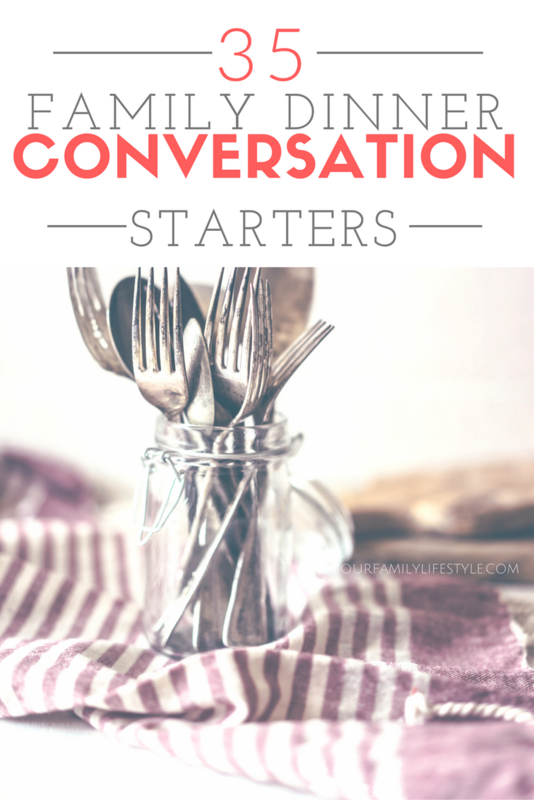 With that in mind, I wanted to share 35 family conversation starters for the dinner table. Name the 3 most interesting things about yourself. Are you grateful for something today? What is it? Would you rather be famous or just rich? Imagine you’re the President. How would you use your position for good? What do you seem to daydream about the most? What is your favorite movie right now? Ever? What has been the best thing about being your age? What random act of kindness have you done lately? Which one chore do you like doing the least? What are you most looking forward in the future? What has been your proudest moment this week? How would you spend a million dollars if I gave it to you? You can’t use the internet or TV for a month, what would you do instead? If a color defined you, which color would you choose? Why? How would you decorate your room if you had the money? You write a blog post about your day, what is the title? If you could travel back in time, where would you go? Why? You are famous for one week, what do you do? If you could have dinner with 1 person, past or present, who would it be? Why? You could easily print a few (or all) onto slips of paper and then place them into a jar. Pull one out when the conversation calls for a bit more and engage. It can be a great way to learn more about your kids, and vice versa. What are some of your favorite family conversation starters?